Mole is a Mexican classic – a thick, dark sauce made with a medley of sweet and spicy chillies, rounded out with bitter chocolate. Served with tender chicken, it’s sublime. Peel and roughly chop the carrots, roughly chop the celery and peel and halve the onion. Toast the peanuts in dry pan until golden, then finely chop. Place the chicken in a large saucepan and cover with water. Add the carrot, celery and onion halves, and season with sea salt and black pepper. Place the pan over a medium heat and, as soon as the water begins to boil, reduce the heat to a simmer, cover with a lid and poach the chicken for 1 hour 15 minutes, or until tender and cooked through. To make the tacos, place the flour and 1 pinch of sea salt in a large bowl and make a well in the middle. Pour 2 tablespoons of oil and 175ml of cold water into the well, stirring in the flour until it comes together into a rough dough – you may need to add a splash more water to help it along. Turn out onto a flour-dusted surface and knead for about 5 minutes, until elastic and smooth. Roll into a sausage shape, 45cm long, then slice into 20 equal-sized pieces. This step ensures your tacos will be all the same size. Roll each piece into a ball, and set aside until you are ready to cook them. If you’ve made the dough a little while in advance, cover with a damp tea towel to stop it drying out. Remove the chicken from the pan and leave to rest for 10 minutes (keep the resulting stock in a sealed container in the fridge or freezer for another day). 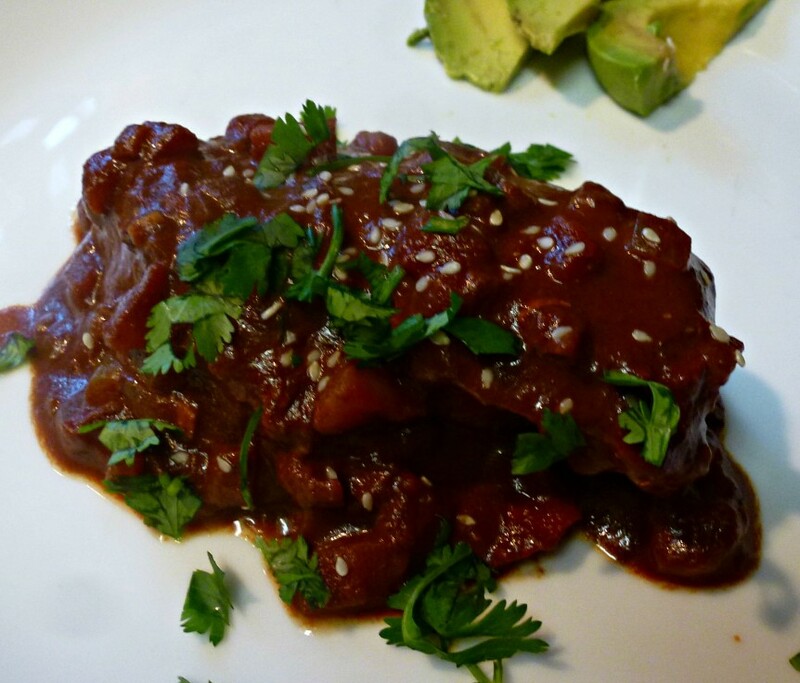 While the chicken is poaching, make the mole sauce. Put the dried ancho chillies in a small saucepan and cover with water. Place over a medium heat and bring to the boil. Simmer for 5 minutes, then remove from the hob and leave to cool completely. Halve and finely slice the fresh chillies, then peel and finely chop the onion and garlic. Toast the peanuts until golden. Place a medium non-stick frying pan over a medium-low heat and add a good splash of oil. Add the onion, garlic and red chillies to the pan and sauté for 10 minutes, until softened but not browned. Stir in the cinnamon, cumin, coriander and oregano, fry for 1 minute, then remove from the heat. Once the ancho chillies have cooled, remove and discard their stems, then place them into a blender. Blitz with a splash of the chilli water until you have a paste, then spoon in the sautéed onion mixture. Add the 50g of peanuts, the honey and the chocolate, and splash in a little more of the chilli water. Roughly chop and throw in the tomato, season generously with sea salt and black pepper, then blitz everything together until you have a thick paste, adding more water if need be. For the pickle, shred the cabbage as finely as you can, either using a mandoline (use the guard! ), a fine slicer attachment on a food processor or the slicer side of a box grater. Toss with the red wine vinegar in a mixing bowl and season well with salt and pepper. Grind the fennel seeds to a powder in a pestle and mortar, and stir through. Once the chicken has rested, discard the skin, shred the meat and toss it through the mole sauce. Scatter over the chopped nuts. It’s really nice to cook the tacos to order as guests are helping themselves to other elements of the meal. Dust your worktop with flour and roll out the dough balls into discs, about the thickness of a playing card. Place a couple of large non-stick frying pans over a medium heat, and cook the tacos as needed, for 1½ minutes on each side, until lightly golden. Serve alongside the mole with the pickled cabbage on the side.